Get PDF: Terry Stocker. 2017. Children, Mirror Neurons and Bullfights. Global Ethnographic. Children and childhood have long been studied in anthropology and have been central to the overall development of the discipline, as demonstrated by the fact that Margaret Mead’s Coming of Age in Samoa is one of the best-selling books in anthropology. However, childhood has only recently become a subject of study in which children are considered a topic worthy of study in their own right (Benthall1992, Schwartzman 2001). The ethnographies making up this subfield now imply a great diversity in definitions of, and ideas about, childhood and the different roles and expectations placed on children according to their cultural background (see Jayaraman 2016, Lancy 2014). For me, watching children, anywhere, as they look at the world is intriguing in a phenomenological sort of way. It helps me think of and understand myself, because we remember so little of life before the age of 5 or 6. For decades, I have watched child labor, when and where possible (see Stocker 1985). One of my favorite examples was outside the Uffizi Gallery in Florence, Italy, in 1978. I arrived a good hour before the Uffizi opening and sat observing. A gypsy woman with five children was there. The children were jumping about playing and laughing and having a wonderful time. About 10 minutes before opening, a crowd had gathered and the woman barked a command, and all five children immediately turned into sad little beggars. I watched them beg with little but some success. What a fitting anthropological way to view the home of the fathers of modern banking – the Medicis. In other words, I had the opportunity to observe child labor before walking into the home of the people who profited the most from it. Unfortunately, I did not have a camera that day. Likewise, observing a child learn is fascinating. Enculturation is a complicated issue involving complex social-cultural mechanisms and prior learning. Now, however, we know that we also learn by certain biological dictates, such as mirror neurons. Mirror neurons were the relatively recent finding by a team of Italian scientists, led by Giacomo Rizzolatti in 1992, at the University of Parma. Mirror neurons are the neurons in our brain that cause children to copy what adults do and thereby learn and become socialized (Spaulding 2013). A famous example is of a man holding, and sticking his tongue out at, a baby monkey and the baby monkey then sticking its tongue out at the man. Many children “copy” laughter from their parents. A very fine concise summation is this. For years I have tried to photograph a child learning via mirror neurons, but that is not easy – without the photo looking posed, at least for me. 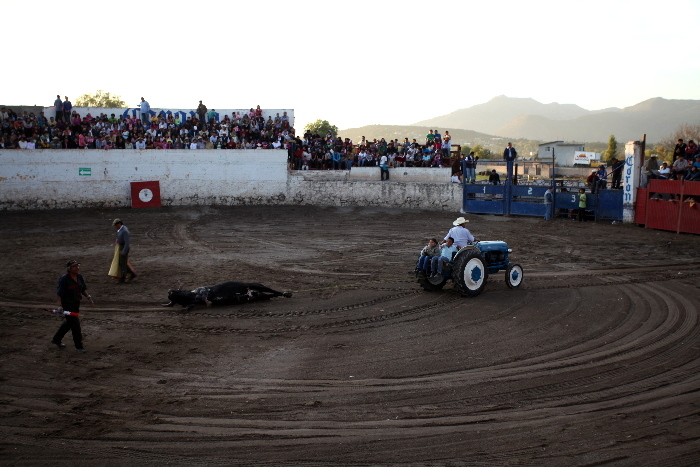 At a bullfight (corrida) in Mexico, I was finally able to do it. The rather extensive literature about bullfights, beginning with Hemmingway’s vivid portrayals (Death in the Afternoon, 1932), does little to prepare a foreigner for his/her first bullfight. Humans torture and then kill an animal in a public display of performance. I personally have had no problem with that, but certain of my American friends have. 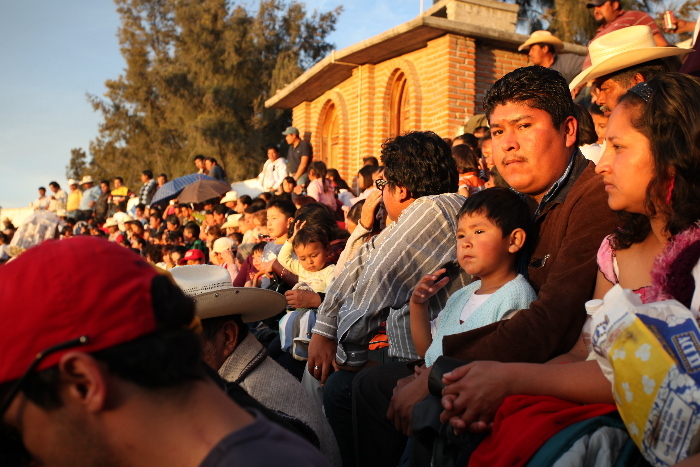 And for sure, there are many Mexicans who voice opposition, and want bullfighting stopped. 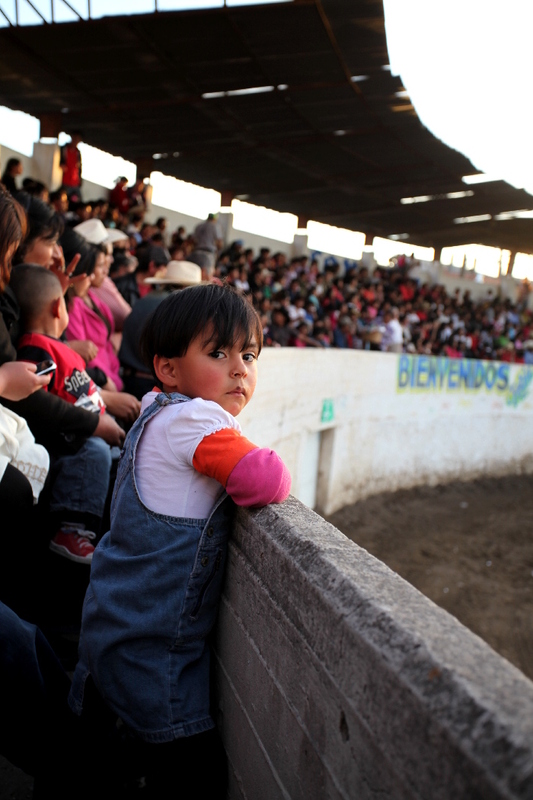 Indeed, in 2013 the Mexican state of Sonora banned bullfighting. Actually, pre-empting “the end” of this piece, it seems bullfighting will pass away from boredom within 20 years. 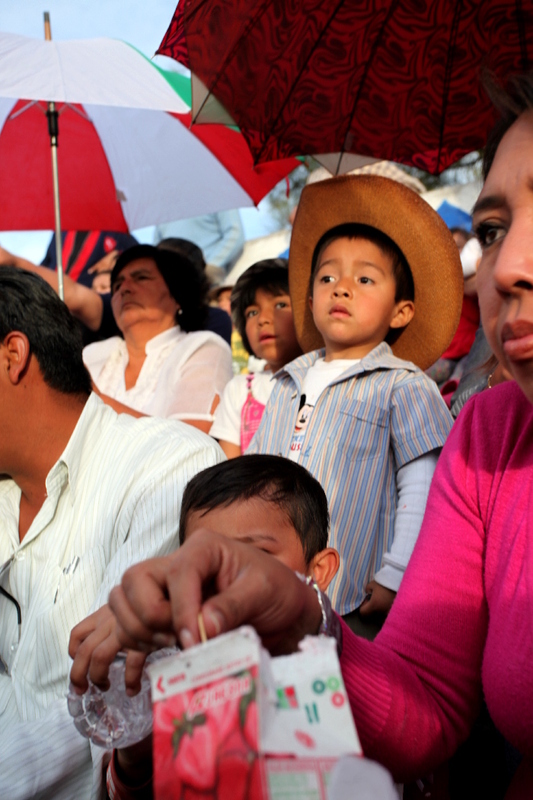 The Mexican crowds seen on television appear to be very reduced these days, dwindling steadily. I can find no recent facts on this for Mexico, however, in Spain, Lebedev provided these 2013 statistics: “Attendances have fallen by 40 per cent in just five years. 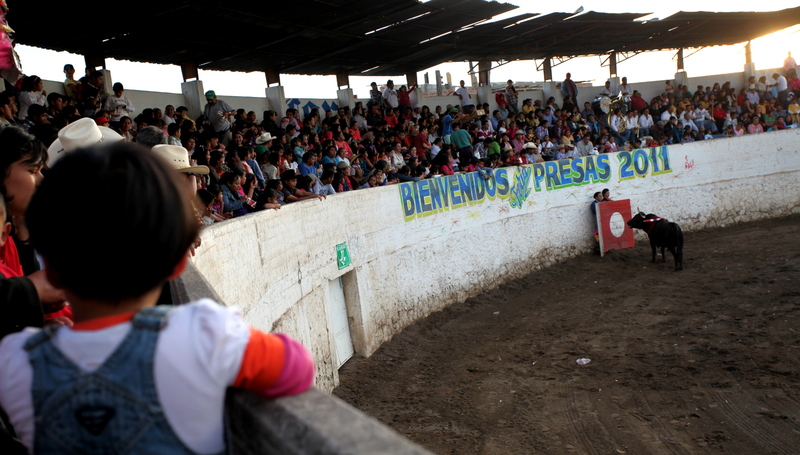 In 2008, some 3,295 corridas were held across the country. Last year, it was 1,997. This year, according to some reports, it will be fewer than 500.” To emphasize, that was four years ago. For those wanting details on certain realities of bullfights, at any search engine enter: “The Romance and Reality of Bullfighting.” For this short ethnography, readers should know that before a matador faces a bull, picadores mounted on heavily garbed and blindfolded horses take long sharp pikes and stab a bull between the shoulder blades. This both enrages the bull and weakens it. If a bull were not weakened, thus hanging its head, it could not be killed by a person driving a sword between its shoulder blades, which is an art. For anyone wanting to understand the beauty of bullfighting, Allen Josephs’ Ritual and Sacrifice in the Corrida: The Saga of Cesar Rincon is a must read. The first bullfight I attended, in 1970, was in Mexico City at the world’s largest bullring. And in truth, I remember no details of that day. Then in the 1990s, I had friends who were aficionados of the art, and I went to many really good bullfights. There is nothing more tedious than a bad bullfight, one reason that bullfights will disappear. The reader should know that the quality of a bullfight depends on the quality of the bull. A bull that constantly charges the matador creates a good bullfight. A “lazy” bull that simply stands and does not charge the matador generates a boring bullfight – the “lazier” the bull, the more boring the bullfight. The reader should also know that if the bull performs really well (charging an “excessive” amount, thus creating wonderful action for the viewers), it can be “pardoned” (indultar) by the matador and may live out the rest of its life in a pasture. I have seen the pardon once in my life. 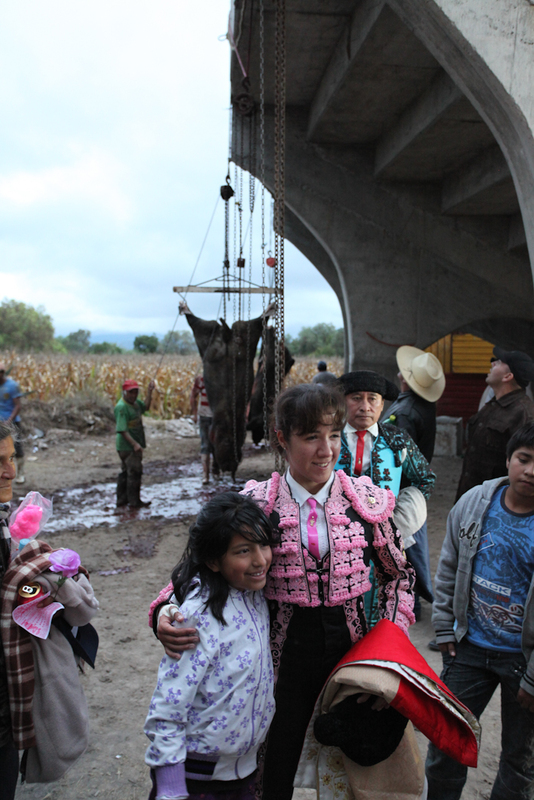 In 2009, I was in the small village of Texcatepec, Hidalgo because a good friend wanted me to see a female matador (my first and his). Hilda Tenorio can be seen on Youtube, but her performances that day were not her best; nor were the other fights. (Again, much of that was the low quality of the bulls). However, I was stunned at the number of young children in attendance, many being carried because they were just babies. 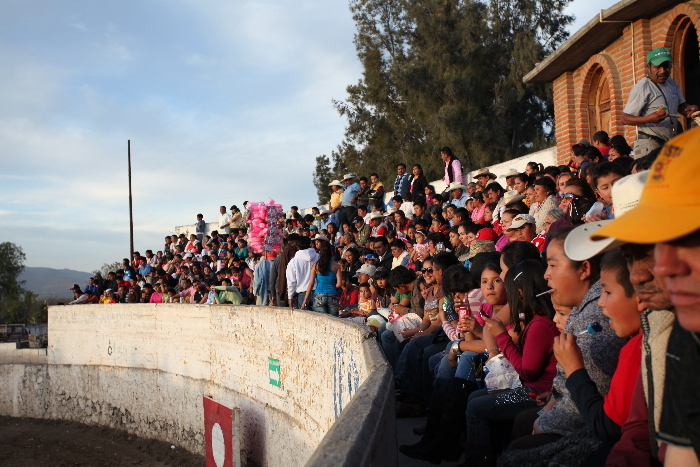 I had never seen that in the large city bullfights. And the place was packed, with about 40 percent children. That day, I did get a photo of a young girl (age 12) with Hilda (Photo 1). One can see the bulls being butchered in the background, and some details on that are in my book Food Wars. 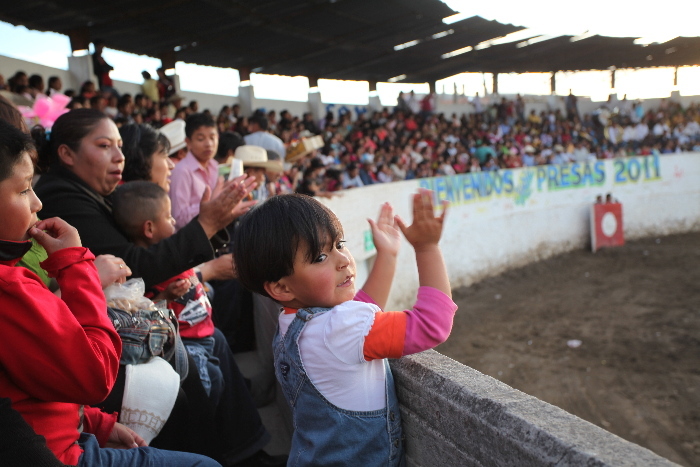 After the Texcatepec bullfight, I began asking everyone around me if they could remember their first bullfights, and the majority could not, obviously because they were very young children at the time of watching their first bullfight. I was also flabbergasted at the number of my old friends who had never been to a bullfight, because: “It is a sport for the wealthy.” Reminiscing about my bullfights of the 1990s, this would seem to be the case, based on dress appearances, including jewelry. 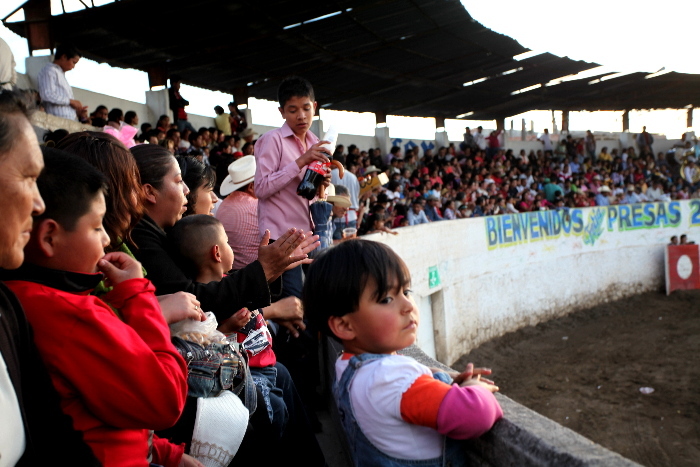 Serendipitously, several of my non-Mexican friends would visit me, in Mexico, from 2010 to 2015, who wanted to see bullfights. I took that time to simply watch the crowds, concentrating on the children. Of course, people do not like to be watched too closely. 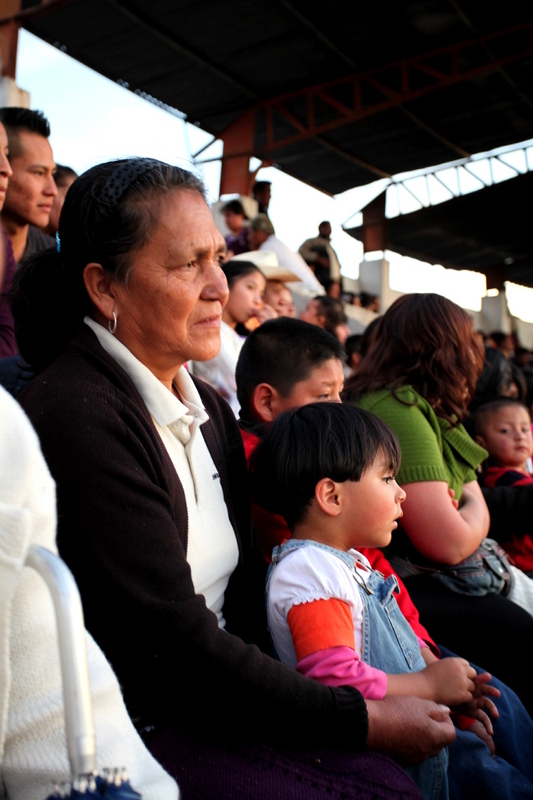 Discreetly watching the crowd in 2011 in Presas, Hidalgo, I tried to focus on mirror neurons, children learning to “see” a bullfight. To my right were many young children (Photo 2) and one so young it had to be held (Photo 3). 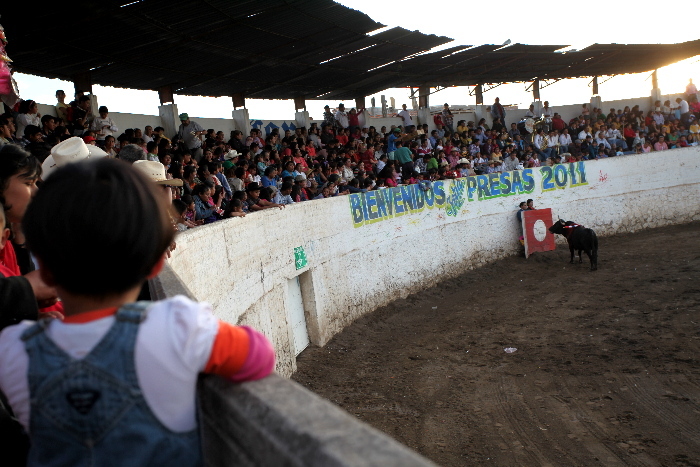 To my left were a woman and her granddaughter (age 5), and the woman assured me it was her granddaughter’s first bullfight1. The girl went through different stages of wonderment and boredom (Photos 4-9). Then when the first bull was killed, some people applauded, and the girl’s mirror neurons kicked in, without any visual cues; and she too clapped for the killing of a bull, which we could reasonably assume she did not understand as death (Photos 10-11). Readers might wonder why more people were not applauding at that time, and it is because for most people a bad bullfight does not merit applause. The reception by children of performance killing of bulls is captured in a photograph of children (ages 11) laughing on the back of a tractor dragging a dead bull away (Photo 12). Obviously there is no certain age at which children comprehend death (Speece and Brent 1992). However, mirror neurons are a factor as children watch adults’ reactions of death. So, for example, if a child lives in a family with no death at an early age, then that child may be older before understanding death. 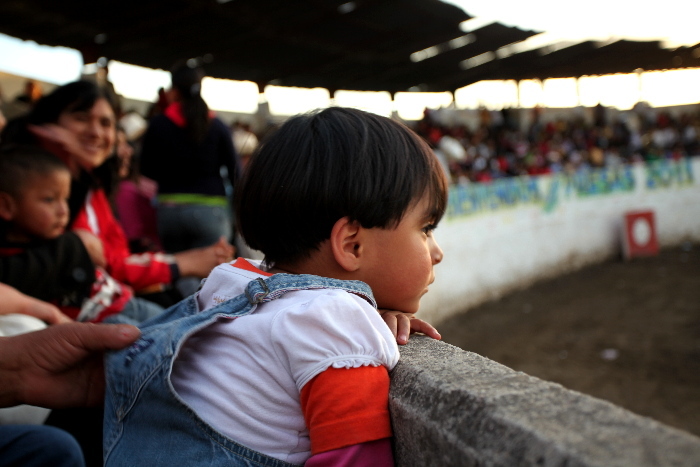 What do children really think of bullfights? In my limited questioning of children of friends (ages 4 to 14), children under 10 don’t really understand the question, as a social or philosophical issue. 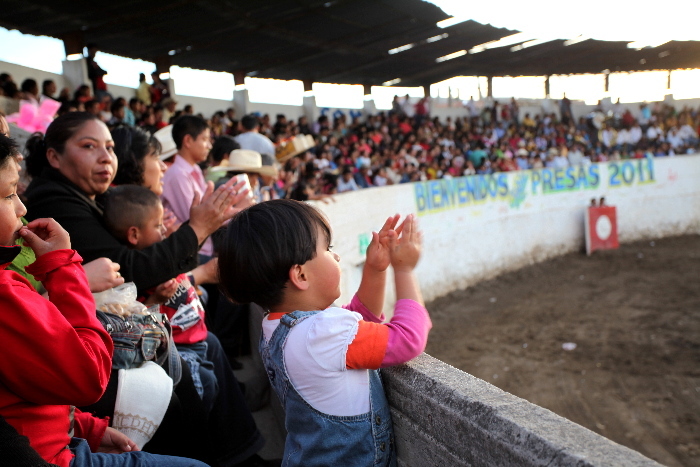 Bullfights are simply entertainment to which they go, and like to go, as accompaniment of their parents (Photos 13-14). At about the age of 12, children begin to form an opinion of emotional like or dislike. One girl (age 14) informed me that she hated the bullfights, but had to attend the yearly pageant in her village because of her parents. So, the girl developed her own “negative” attitude; it was not mirror neurons. In the future, hopefully an anthropologist will try to video such question and answer sessions. To end this short note, I recommend that readers watch this video on child bullfighters. I mentioned previously that bullfighting will pass away from boredom in 20 years. The crowd in the rural, makeshift wooden-arena (of this video) would seem to speak against such a notion. Yet, what we are witnessing are manifestations of stimulation theory (See Hutchison 2008). In the words of Jan-Benedict Steenkamp (2010), this is sometimes called “optimal levels of stimulation.” The notion that human behavior is sometimes instigated by the mere desire to attain a satisfactory level of stimulation has figured prominently among psychological theories investigating motivational tendencies as causes of people’s actions. People tend to prefer intermediate levels of stimulation, referred to as the optimal stimulation level (OSL) in the literature. There are reliable individual differences in the amount of stimulation considered optimal by a given person. To attain a satisfactory level of stimulation, a person may engage in exploration of the environment. So, in cities where individuals have many recreational options (that provide stimuli), bullfighting is declining. In rural areas, where recreational options are limited, crowds, though small, are the norm. 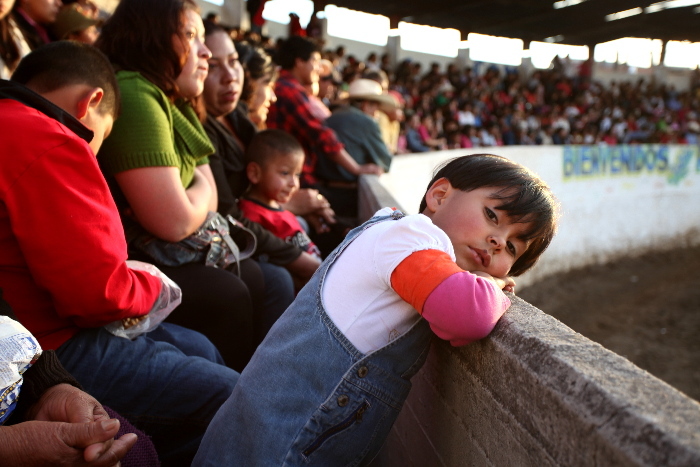 Yet, it has only been in the past 3 to 4 years that rural Mexican children have acquired cell phones, with video games; and so we will wait to see the impact on their future behavior and the future of bullfights. In the meantime, any reader might judge the situation her or himself, by looking at Mika Boedeker’s short article: “Optimum Stimulation Level and Recreational Shopping Tendency”. I asked the grandmother’s permission to photograph the girl, and it was enthusiastically given. Likewise, I asked those nearest me in all of my photos if I could photograph them, and permission was always granted. This article would never have been possible without my learning from Ko Kwangmun and Michael C. Robbins. Benthall, J. (1992). “A Late Developer? The Ethnography of Children.” Anthropology Today, 8(2), pp. 1-22. Boedeker, M. (1995). “Optimum Stimulation Level and Recreational Shopping Tendency.” European Advances in Consumer Research, 2, pp. 372-380. Hutchison, E. (2008). Dimensions of Human Behavior: Person and Environment. California: Sage Publication. Jayaraman, N. (2016). “Culture Circulates at the Heart of Childhood”. Global Ethnographic, available at http://www.globalethnographic.com. Accessed on 30 March 2017. Lancy, D. (2014). The Anthropology of Childhood: Cherubs, Chattel, Changelings. Cambridge University Press, Cambridge. Lebedev, E. (2013). “Will Bullfighting Survive in Modern Spain?” Independent, August 23, 2013. Schwartzman, H. (2001). “Children and Anthropology: A Century of Studies”. 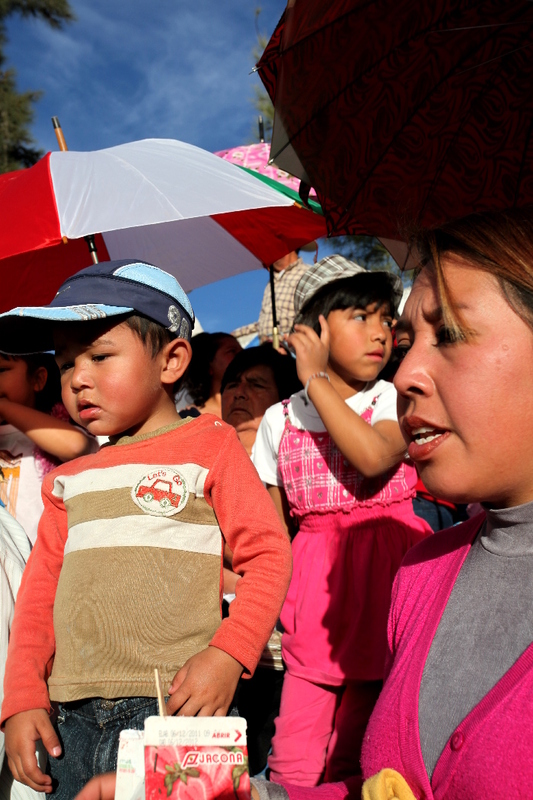 In Children and Anthropology: Perspectives for the 21st Century. Edited by Helen B. Schwartzman. Westport, CT: Bergin & Garvey, pp. 15-37. Spaulding, S. (2013). “Mirror Neurons and Social Cognition.” Mind and Language, 28 (2), pp. 233-257. Speece, M.W. & Brent, S.B. (1992). “The acquisition of a mature understanding of three components of the concept of death.” Death Studies, 16(3), pp. 211-229. Stocker, T. (1985). “A Unique Variation of Child Labor (in Mexico)”. Paper presented for the American Anthropological Association, D.C.
Stocker, T. (2012). Food Wars: Should we eat dog, horse, whale? Kindle, available at https://www.amazon.com/Food-Wars-Should-horse-whale-ebook/dp/B007QW01EK/ref=sr_1_1?ie=UTF8&qid=1490881454&sr=8-1&keywords=terry+stocker, accessed 30 March 2017. Steenkamp, J. B. (2010). Optimum Stimulation Level, Part 3. Consumer Behavior. Wiley International Encyclopedia of Marketing, available at http://onlinelibrary.wiley.com/doi/10.1002/9781444316568.wiem03018/abstract. Accessed 30 March 2017.